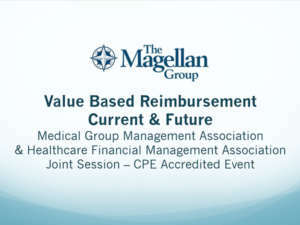 Value Based Reimbursement Current & Future – Medical Group Management Association & Healthcare Financial Management Association Joint Session – CPE accredited event. 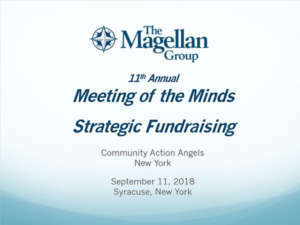 Magellan Partner Greg Hiczewski, MBA, CPA presented to a joint meeting of the Healthcare Finance Management Association and the Buffalo Chapter of the New York Medical Group Management Association. The topic was the current state and future of Value Based Reimbursement (VBR). This presentation addressed VBR at the Federal level, commercial insurance and New York State Medicaid Reform (DSRIP) and the connection to VBR. At the state level, we discussed the integration of medical services, behavioral health, and community-based organizations and the importance of the social determinants of health in improvements in the overall health of individuals, populations and reducing the cost of care. GetSET (Get Success in Extraordinary Times) is an initiative of the John R. Oishei Foundation, Peter and Elizabeth Tower Foundation and the Ralph C. Wilson, Jr. Foundation. Cohort participant agencies are paired with Organization Development consultants and undergo an organization assessment, develop a Capacity Plan focused on eight core competency areas and develop a Value Proposition in order to position the agency for changes in value-based payments from major payors. Marta Hiczewski, MS was asked to provide a Cohort education session on leveraging the agency value proposition to get the most value back to the organization. Key to the leverage process is listening to the payor. Understanding who the decision-makers and influencers are within a payor organization is important to the process. Developing a collaborative relationship is a significant part of the positioning the organization for a successful conclusion. Partner Marta Hiczewski, MS was asked to speak to woman entrepreneurs and small business owners about the importance of customer experience marketing. 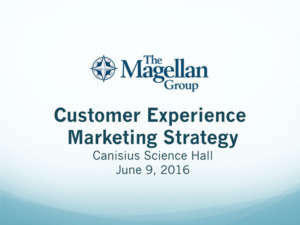 Customer experience marketing focuses on engaging your customers where they are most likely to be receptive of your message, in a manner that speaks to their interests and integrating sales to reach goals. Spending time each week to formally track customer purchase habits, interests and contact information will allow for segmenting customer groups in a way that provide insight into positioning products and services that will resonate with customer need. Non-profit organizations raise funds in a variety of ways to support programs, services and the administrative costs that are required of sustainability. One of these fundraising methods are Events. Events can be a good way to raise money, the question is whether a particular Event is the right fit for your organization. In this training module, Marta Hiczewski, MS, asked the statewide group to take a close look at current and prospective events. Included in the presentation is a process to analyze Event value. Don’t forget to consider the toll Events can take on the staff, volunteers and Board members. The best use of these assets may be in another place. The Community Foundation for Greater Buffalo received a W.K. Kellogg Foundation grant to create the Communities of Giving Legacy Initiative to cultivate positive change in the lives of trailblazing youth of color living within Western New York. CGLI delivers on this mission through endowment building, engaging strategic partners, and supporting intentional community connections. 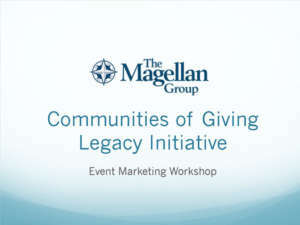 CGLI engaged Magellan Partner Marta Hiczewski, MS to provide educational workshop on Event Marketing. In order to get the most out of an event, Events should tie into organization strategy. Particularly in small organization’s including building relationships and prospects into the event follow-up is very important.